With national sugar high day (AKA Halloween) approaching we thought we would give a shout out to our furry friends. There is no doubt that a dog is man’s best friend; a companion who will always be faithful to your life. It is therefore logical that any dog owner would want to get the best for their most cherished companion. You therefore have to take good care of your best friend just like you will do to yourself and any other human who matters to you. Since you dress yourself to look sassy and fashionable, to protect yourself and fit into the trendy crowd, you also need to dress your pet with the same degree of consideration. 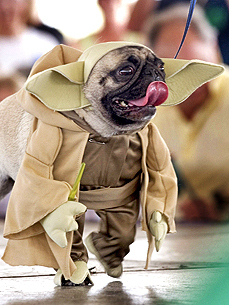 Today, you are able to achieve this through the use of designer dog clothes such as the Yoda Dog Costume. 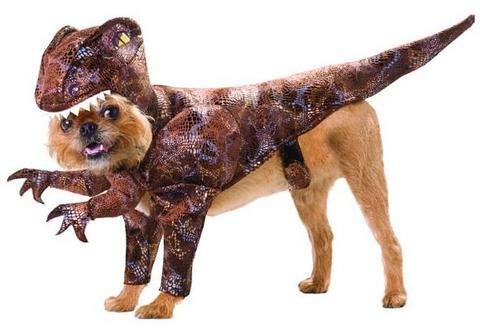 If you want your dog to look fashionable during the animated and rather adventurous Halloween holidays, some Dog Halloween Costumes would fit in perfectly. It really does not matter which season of the year the Halloween season comes but in any case, you have got all you need to make it memorable; this is both for you and for your best friend. 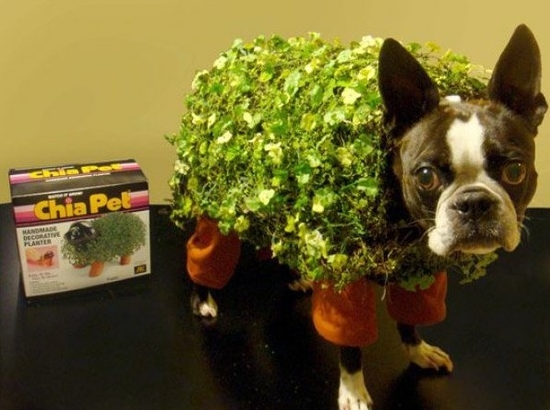 Your dog can look very fashionable with some parsley from your garden and then BOOM, instant Chia Pet. As much as the aspect of you and your dog adorning the same kind of an outfit might look rather comical and silly, this is a modern trend that has been growing in popularity over the past couple of years. This trend has diversified dog clothes designs and as such, people are getting to appreciate the fact that dogs are actually something more than mere accessories. They are living creatures that have to be treated with dignity and honor owning to the fact that they play a very important role in life. There is no doubt that every dog has got some degree of a distinct personality. This can be easily implied or reflected by clothing it in some sassy t-shirt or even an entire outfit. 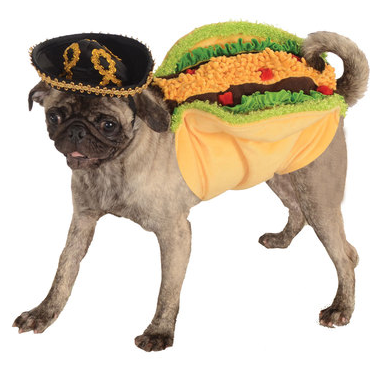 As per modern trends, it seems like most taco costume, pirate costume and dinosaur costume and other costume manufacturers are more inclined towards smaller breed dogs. However, larger breeds can also benefit largely. Today, if you do your research right, you will come across a wide range of dog clothes in the market. This includes outfits created for special occasions such as Christmas, Halloween and even for Weddings. Take note of the fact that modern clothes are much easier to fit since they are designed for specific breeds of dogs. Just like there are many benefits of dressing your dog, so are the demerits. 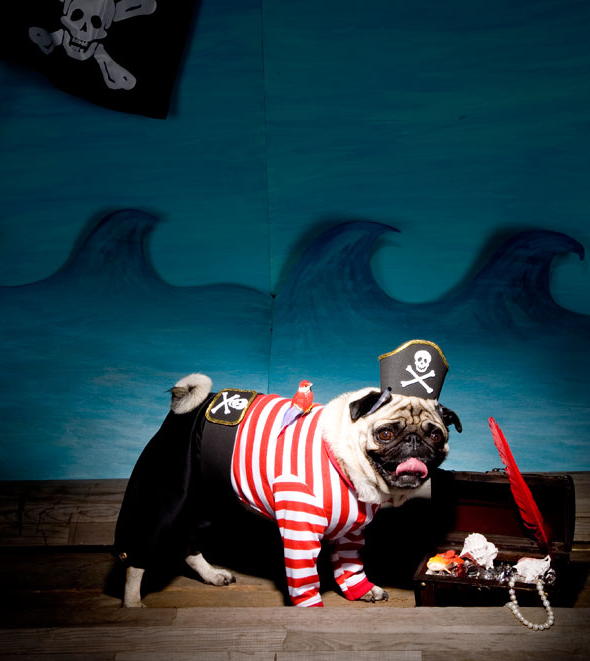 One thing you need to understand is that not all dog breeds feel comfortable adorning the pirate costume, taco costume, dinosaur costume or any other type of costumes out there in the market. Some materials used in designing these outfits are prone to allergens and other disease causing elements. They might also not offer adequate aeration and therefore, proper choices ought to be made. Much as you might be interested in making your dog look and feel fashionable, you also need to consider its comfort. Whether you are buying the Yoda Dog Costume or other Dog Halloween costumes, you need to understand that dog breeds are quite different. When you are buying clothes for your dog, you have to consider its size and the amount of fur on its body so as to ensure that the clothes are comfortable and guarantee a high level or protection. The dog clothes which you will come across in the market today are the one-size fits all kind of thing. Again, the thickness and padding of the material is not always meant for all breeds. In that case therefore, when you are buying clothes or costumes for your dog, you have to consider a number of factors, comfort of course being the main one. So just please be aware that no matter what your plans are for this Halloween season, your furry friend will also be having fun. Make sure they look snazzy doing it!